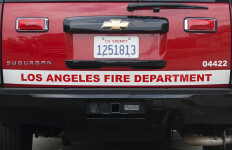 Authorities are attempting to determine whether there was a connection betweent some failing underground electrical vaults Sunday and reports by several residents about their electrical panels producing smoke and subsequent attic and garage fires in the Arlanza neighborhood of Riverside. About 5,000 customers and 60 streets are without power, with complete restoration expected within 24 to 48 hours, said Riverside Fire Department Battalion Chief Bruce Vanderhorst. Firefighters responded at 1:08 a.m. to an underground electrical vault malfunctioning in the 9000 block of Alta Dena Drive and found reported some electrical vaults “glowing red producing smoke, lights in the area flickering and Christmas light strands glowing red the entire length of the strand,” Vanderhorst said. By then, several residents reported their electrical panels were producing smoke at the house service connection and a resident reported her garage was on fire in the 6900 block of Keating Drive, he said. There were no civilian or firefighter injuries reported, Vanderhorst said.